All Bucc Booster Meetings are held at 7:00pm on the last Wednesday of the month at the End Zone Hall. To become a member you may download the membership form and mail it in with your payment to the address provided on the form. 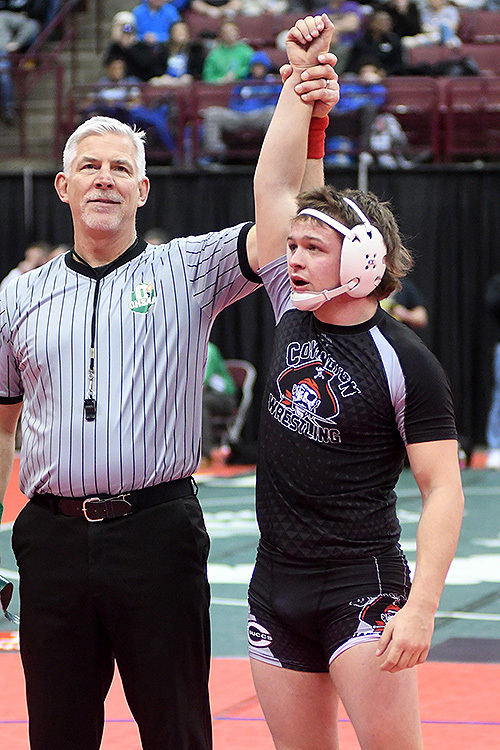 NOTE: PHOTOS FROM THE STATE WRESTLING MEET ARE NOT AVAILABLE FOR PURCHASE DUE TO OHSAA RULES AND REGULATIONS. 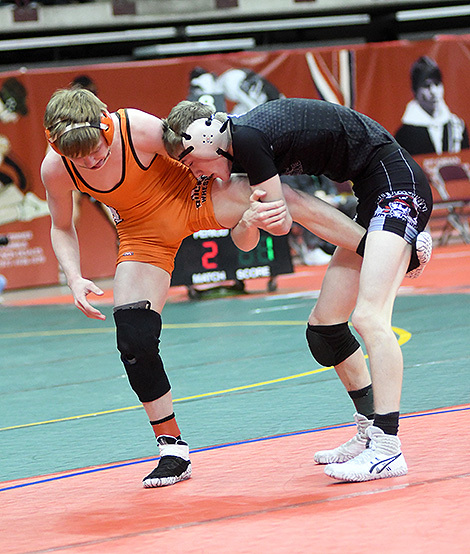 Keringten Martin lcoks up a big takedown in the consolation final against Noah Inboden of Nelsonville-York. Saturday was a fitting end to a memorable state tournament for the Covington Buccaneers as senior Keringten Martin placed third at 152 pounds and sophomore Cael Vanderhorst took fourth at 113 pounds to give the program at least one state placer for the 12th consecutive year and 25th state medal in school history (22nd state medal since 2005). In the consolation semifinal on Saturday, Keringten Martin faced off with Ryan Marvin of Swanton in a rematch from the first round of the tournament where Martin picked up a 9-5 win. This time points were hard to come by as both wrestlers were very sound defending each other’s shot attempts. But after a scoreless opening frame, Martin was able to escape from the bottom and picked up a huge takedown with 18 seconds left in the frame for a 3-0 lead. Marvin chose bottom in the third and Martin was forced to surrender the escape point to make the score 3-1. The Buccaneer wrestler then fended off a late takedown attempt by Marvin to hold on for the 3-1 win. Coach Vanderhorst felt it was the difference in the match. Martin advanced to the consolation final against Noah Inboden of Nelsonville-York. And it took some adjustments during the match by Martin to get the job done in a 4-1 victory for third place. Martin also came up big with a takedown late in the first period. Martin surrendered an escape in the early seconds of the third and was able to stay in solid position on his feet throughout the remainder of the match. This forced Inboden to take a chance late and Martin was able to catch his opponent for a match-sealing takedown. For Martin, who becomes the 14th wrestler in Buccaneer history to earn a state medal, the experience at state was something he will carry with him the rest of his life. He also had the time of his life accomplishing his goals. 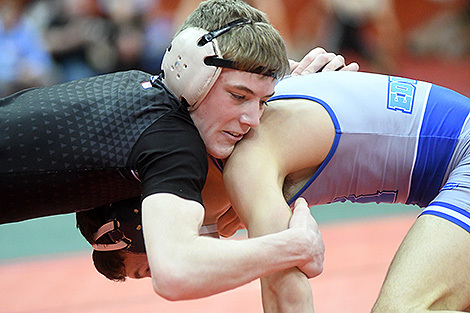 Cael Vanderhorst (50-6) became just the 8th wrestler in school history to become a multiple state placer as he took fourth at 113 pounds after placing eighth a year ago as a freshman. He also captured his 100th career win. Being a competitor, Cael is happy to finish higher on the podium than last year, but hoped for more. In Cael’s 8-0 win over Collin Yinger of Nelsonville-York in the consolation semifinal round, Vanderhorst set the tone of the match with an early takedown. Then after escaping to start the second period, the Buccaneer sophomore recorded another takedown and nearly picked up the pin. 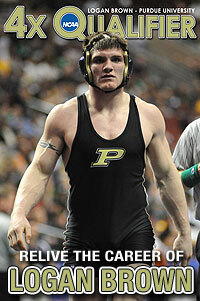 Instead, Vanderhorst settled for three back points and an 8-0 lead with two minutes left to wrestle. And the final two-minutes was a clinic on wrestling from the top position as Vanderhorst controlled Yinger for the entire third period to preserve the 8-0 major decision victory. In his consolation semifinal match, Cael faced Caleb Edwards of Rootstown in a rematch from the quarterfinals where Vanderhorst defeated the Rootstown wrestler 13-8. This time it was a low scoring match as neither wrestler could gain much offensive success. Vanderhorst scored first on an escape in the second period, but Edwards was able to record a critical takedown off of a scramble midway through the third period. Vanderhorst was close to getting a reversal and then close to recording an escape, but Edwards was able to hold on for the narrow 2-1 win. But the fact that Vanderhorst became a two-time state placer as a sophomore and was very close to winning the two matches he lost only ads fuel to the fire for his junior year. Vanderhorst the coach isn’t ready to look forward to next year quite yet. Instead, he is soaking in what his three Buccaneer wrestlers were able to accomplish at state. What is bittersweet is the fact that Martin will not be back next year. The senior finished his season with a 54-3 record and recorded over 150 wins in his career. 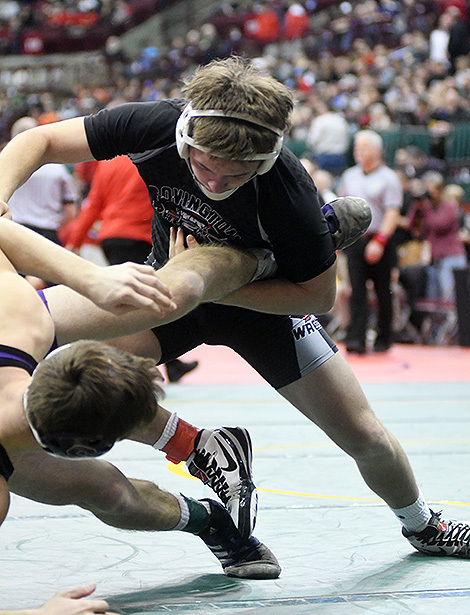 For Martin, placing third at state is rewarding, but what made it even more special was the experience of competing at state in two straight years with close friends Cael Vanderhorst and Kellan Anderson. And the leadership Martin provided Anderson and Vanderhorst is something Cael hopes to pass on to teammates down the line. 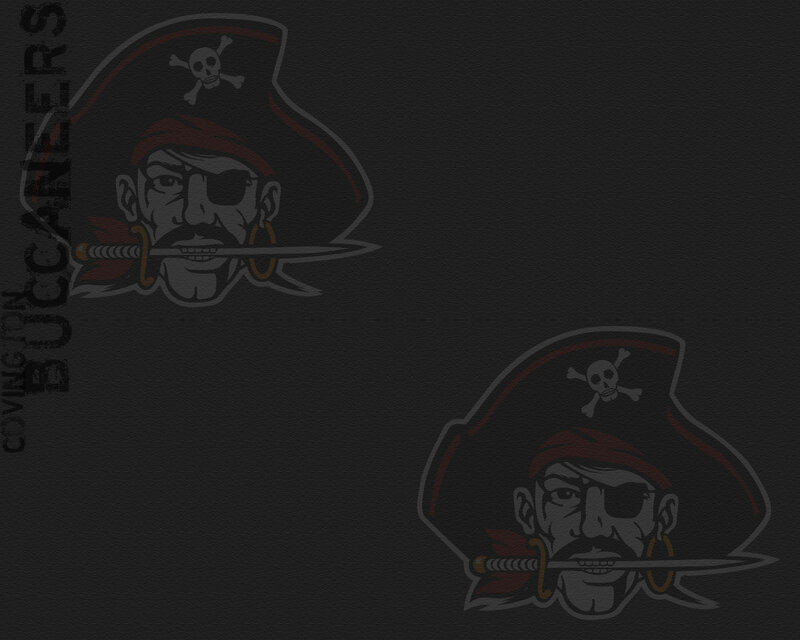 Which hopefully leads to more Buccaneer success in 2020. 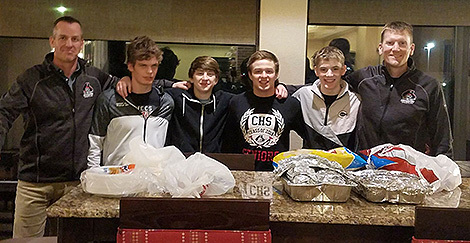 The Covington wrestlers and coaches thank former Buccaneer wrestler Chad Westfall, his wife Sandi and Big Lots for donating a meal to the wrestlers in between sessions. Cael Vanderhorst works for control during his consolation finals match against Caleb Edwards of Rootstown. Keringten Martin finishes a takedown in the consolation semifinal against Ryan Marvin of Swanton. 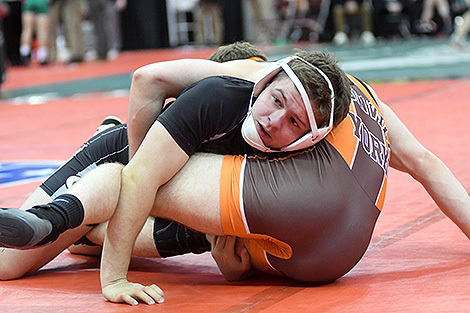 Cael Vanderhorst controls Collin Yinger of Nelsonville-York during the consolation semifinals on Saturday.